DESCRIPTION A superbly appointed substantial Georgian style residence offering STUNNING VIEWS towards the South Downs and backing onto Sullington Warren to the rear approached via pillared automatic wrought iron gates, extensive parking, SWIMMING POOL and pool house. and beautiful landscaped gardens. Internally the property is presented in first class order throughout and offers spacious accommodation extending to 3600 square feet including the detached ANNEXE/STUDIO & office which offers versatility for independent living or office usage. Features include: impressive main reception hall with feature staircase and galleried landing, ground floor cloakroom, drawing room, dining room, family room, bespoke fitted Antique pine kitchen/breakfast room, four first floor bedrooms with en-suite to master bedroom, family bathroom and games room/bedroom five (30' x 17'3). Outside there is extensive parking with four car garage, raised terrace to the front with further lawned gardens to the rear with swimming pool area, decked terrace and pool house. Viewing highly recommended for this rarely available property. RECEPTION HALL Impressive balustrade with understairs storage cupboard, double doors leading to sitting room. GROUND FLOOR CLOAKROOM Low level flush w.c., radiator, part tiled walls, pedestal wash hand basin, tiled flooring. SITTING ROOM 17' 10" x 14' 11" (5.44m x 4.55m) Delightful outlook across the front gardens and towards the South Downs, uPVC double glazed sash windows, feature open fireplace with pine surround and cast iron inset and slate hearth, radiator, coved ceilings. DINING ROOM 15' 0" x 14' 0" (4.57m x 4.27m) Double glazed sash windows with view directly towards the South Downs, radiator, coved ceilings. 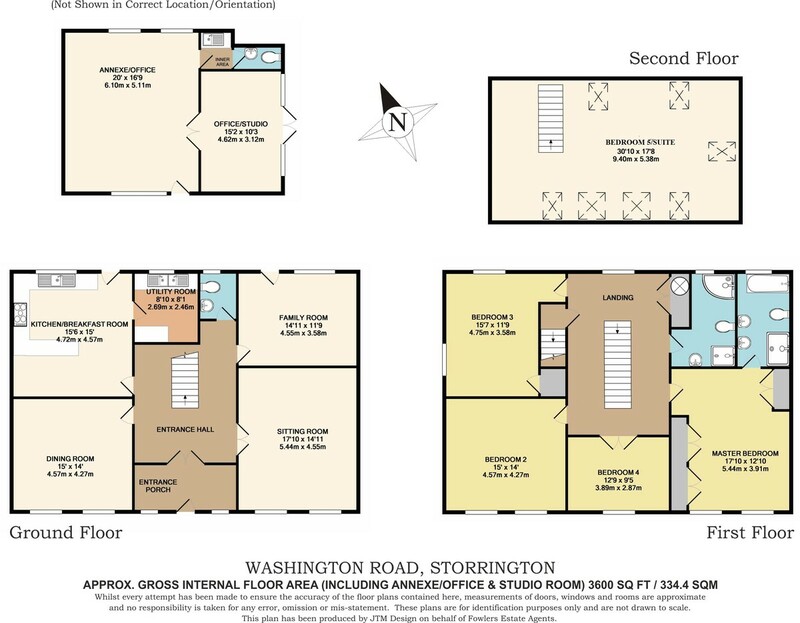 FAMILY ROOM 14' 11" x 11' 9" (4.55m x 3.58m) Dual aspect, double glazed sash windows, radiator, door to side access. UTILITY ROOM 8' 10" x 8' 1" (2.69m x 2.46m) Stainless steel double drainer twin bowl sink unit with storage cupboards, space and plumbing for washing machine and venting for tumble dryer, further solid wood working surfaces with storage under suitable for freezer etc., built-in larder cupboard, wall-mounted 'Alpha' boiler servicing hot water and separate 'Alpha' boiler for central heating. FIRST FLOOR GALLERIED LANDING Built-in shelved linen cupboard housing Megaflow system. EN-SUITE BATHROOM Inset Jacuzzi bath, fitted Victorian telephone grip central shower attachment, low level w.c., twin set of pedestal wash hand basins, fully tiled walls, double glazed obscured glass sash window, separate double shower and steam room with independent shower unit and controls, tiled flooring, extractor, electric underfloor heating. BEDROOM TWO 15' 0" x 14' 0" (4.57m x 4.27m) Twin set of double glazed sash windows with stunning direct views across open farmland and towards the South Downs, two radiators. BEDROOM THREE 15' 7" x 11' 9" (4.75m x 3.58m) Dual aspect double glazed sash windows with views towards the South Downs and Kithurst, radiator, built-in wardrobe cupboard. BEDROOM FOUR 12' 9" x 9' 5" (3.89m x 2.87m) Arch sash window with views towards the South Downs, radiator. FAMILY BATHROOM Corner bath, corner shower unit with sliding Perspex and chrome screen with fitted independent shower unit, tiled flooring, low level flush w.c., extractor fan, concealed spot lighting, pedestal wash hand basin, radiator, part tiled walls, underfloor heating. BEDROOM 5/SUITE 30' 10" x 17' 8" (9.4m x 5.38m) Range of Velux windows giving triple aspect with views towards the South Downs and beyond, wall-mounted thermostat control for central heating, two radiators, eaves storage cupboards, spot lighting. GARAGE 35' 7" x 21' 0" (10.85m x 6.4m) Automatic up and over door, radiator, power and light, concealed spot lighting. CLOAKROOM Low level flush w.c., wash hand basin, extractor. DECKED BALCONY AREA Overlooking swimming pool and gardens, steps down to pool. PARKING Pillared entrance with driveway leading to automatically operated wrought iron double gates, tarmac driveway area with parking for several vehicles. FRONT GARDEN Paved patio with ornamental pond, enclosed by brick walling and mature trees and shrubs, security lighting, raised brick paved terraced area giving direct views towards the South Downs National Park. SIDE PARKING AREA Parking for several vehicles accessed via single wooden gate leading up to further brick paved parking area leading onto annexe, outside water tap, outside lighting. TWO BRICK BUILT STORES Stores adjoined with a pitched roof with one measuring 17' 8" x 8' 10" (5.38m x 2.69m) and the other 9' 10" x 8' 10" (3m x 2.69m). REAR SECTION OF GARDEN Mainly laid to lawn enclosed by fence panelling with attractive flower and shrub borders, security lighting, large double gate giving access to Heather Lane and the Warren (National Trust land). SWIMMING POOL 28' 0" x 14' 0" (8.53m x 4.27m) Wall enclosed mosaic tiled heated swimming pool. Maximum 1.5 meters depth. Pool-side lighting, stone terraced area. DETACHED POOL HOUSE 22' 1" x 9' 5" (6.73m x 2.87m) Traditional construction with pitched roof, uPVC double doors, changing area with tiled flooring, two radiators, walk-in wet room which is fitted with an independent shower unit and concealed spot lighting. SEPARATE ENCLOSED CLOAKROOM Low level flush w.c., tiled flooring, wash hand basin. BOILER ROOM Housing filtration system, wall-mounted 'Alpha' boiler servicing pool house and annexe, floor mounted Laarslite gas boiler for heating the pool.